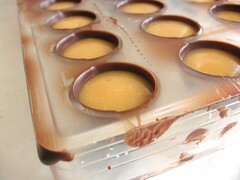 Salted Caramel Chocolates - Do You Know The Muffin Man? Notes: For the shell, I used Cacao Barry Cuba Pure Origin 70%, a dark chocolate with a noticeably fruity taste, almost like extra-virgin olive oil. 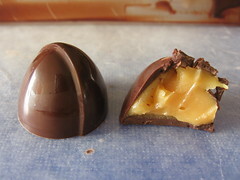 The caramel centre is made with white chocolate, and tastes like butterscotch. Tempering is getting better, as you can see from the shiny shells, but still not perfect. The mold for these chocolates is made by the Italian company, Chocolat Form; I bought it from Design & Realisation.